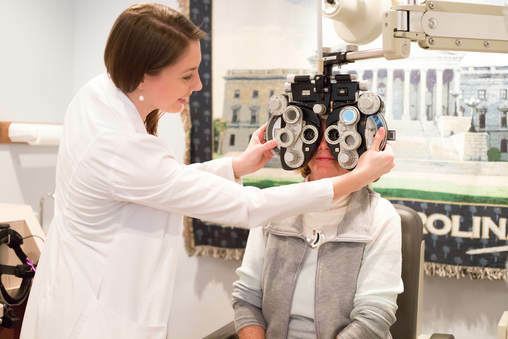 "My husband and I just moved to the area and are glad we found Fort Mill Vision Center. The staff is courteous, friendly and professional. We spent only a few minutes in the waiting room before we were shown into exam rooms. The examinations were thorough and Dr. Dutson took time to explain the diagnosis. He is knowledgeable and personable. I would highly recommend Fort Mill Vision Center." "They were so patient with me when I first tried wearing contacts. I love the high tech gadgets that can be used instead of having to dilate my eyes. This means I can schedule an appointment on my lunch hour and return to work and not be blinded until my eyes return to normal." "Deborah Long has such a great since of humor and is always very straight forward during the examination process. The work staff was very aware of what my insurance did and did not pay to help my visit be affordable as possible." "Our appointments are easy to schedule. The staff is friendly and helpful. Dr Long is professional as well as personal. Love the feel of the office. It's cozy, warm, & has the feel being @ home. We always feel welcomed, even just to walk in for an adjustment to our glasses!" The team here is fabulous, Dr Thomas was a delight, very patient, explains things at your level and doesn't try to sell you on things you don't need, so glad I found them, highly recommend! I chose Fort Mill Vision center based on the reviews and they were not wrong. On-time, expedited and thorough service with a great doctor and staff. Couldn't be happier. Thank you!